It’s officially fall, even though it’s still in the mid 80s here in Charlotte. Halloween is right around the corner. Decorations and candy have been in stores for weeks now. I already bought my plastic pumpkin several weeks ago. Before you know it princesses, pirates, Doc McStuffinses, cats, and goblins will be at your doorstep with their bags open waiting for their goodies. Some these characters may have food allergies or sensitivities. If you come across a home with a teal pumpkin, this means that they have treats that are allergen-free. This pretty pumpkin lets trick-or-treaters know that you have allergen-free treats. You can provide non-food options or options that are allergen-free for trick-or-treaters. If you’re looking for Halloween candy that’s gluten-, soy-, & dairy-free, there are quite a few that meet that criteria. Real talk. There is much more candy than I realized and I came across several blogs that have done their homework. Rather than trying to make my own list which would have the same items as their list, I decided to include them into one blog. These bloggers put a lot of effort into their lists and they should be commended for taking the time to put these lists together. As with many foods, some candies that are gluten-free, still contain soy and/or dairy. Below are several lists split into category based on all ingredients you are trying to avoid. As always, please be sure to read the ingredients on the actual packaging before purchasing. This comprehensive list by Jane Anderson was also reviewed by a board-certified physician. Sure Foods Living list companies in alphabetical order along with their ingredients. There are also separate lists for allergen-free candy and natural/organic candy. This list is from 2015, so please be sure to double check ALL ingredients. This website provides a list of a variety of candy & snacks, including soy-free and GFCF candy. AvoidingMilkProtein.com has a list of brands with their responses. You can also choose various food lists, such as egg-free, gluten-free, and nut-free. 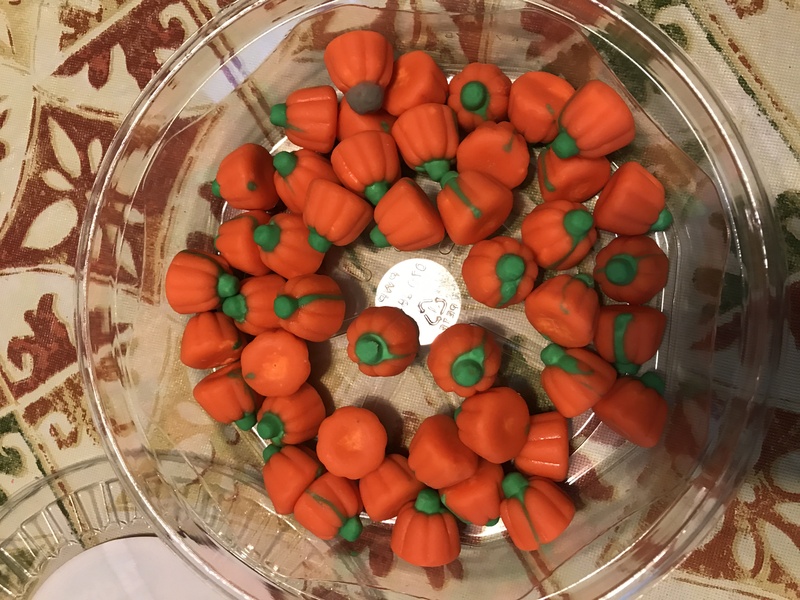 Natural Candy Store is an online shop that sells gluten and soy-free (and specifically soy-free Halloween candy. You can shop from specific lists for candy that is vegan, non-GMO, dye-free, fair-trade, made in the USA, or allergy-friendly. 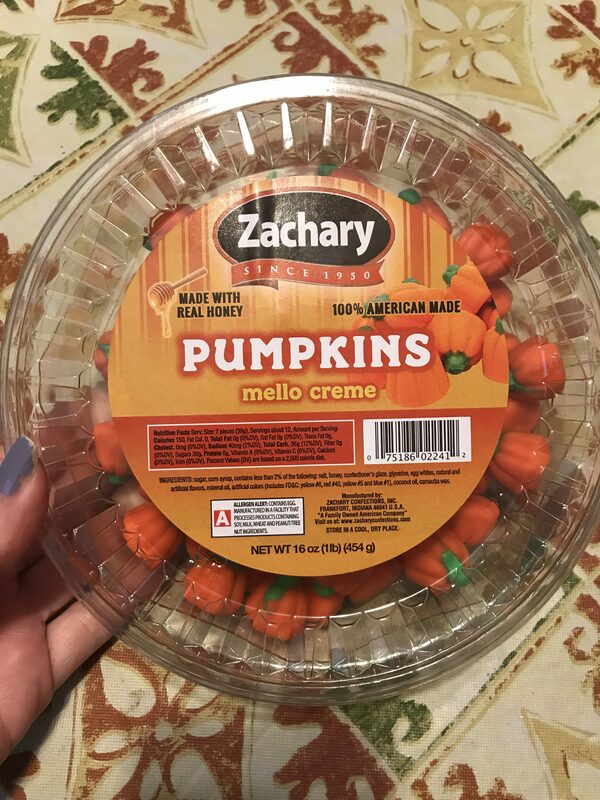 Zachary’s Pumpkins (and candy corn) is gluten-, soy-, and dairy-free. I proudly admit that I love candy corn. This is my second container of the season. Update 9/27/18: We tried some of No Whey Chocolate’s Halloween Candy & reviewed it here. What is your favorite Halloween candy? Do you recommend any dietary-friendly Halloween candy or non-food treats? If you liked this review, you might also like this review of Easter candy. Please share this list with anyone that may find this helpful. Don’t forget to follow GFS on social media. I like the idea of the teal pumpkins. As a parent I prefer non treat homes just because my kids really don’t need all that sugar. But I can see how this is helpful for parents who children have mild or severe allergies. There are parents who feel the same as you, Cia, so I think having non-food treats are good to have on hand for any family that prefers no candy or wants to play it safe with candy. Dietary Restriction can be so tricky especially during the holiday season and all the dinners and lunches, and of course the candy. I am glad that you have put our resources for people who might need this. I for one am trying to stay away from candy as much as possible – Haha! Oh my goodness, the teal pumpkin idea is so cute! I’ve never celebrated Halloween in fullness as I am in the UK but I can imagine how hard it must be for children who can’t enjoy all the goodies their friends are – this is such a sweet idea! I love the idea & it’s also one of the colors of my favorite football team as well. 🙂 It really is a great way to promote awareness and to help families know which homes are safe for their children to receive candy or non-food treats from. 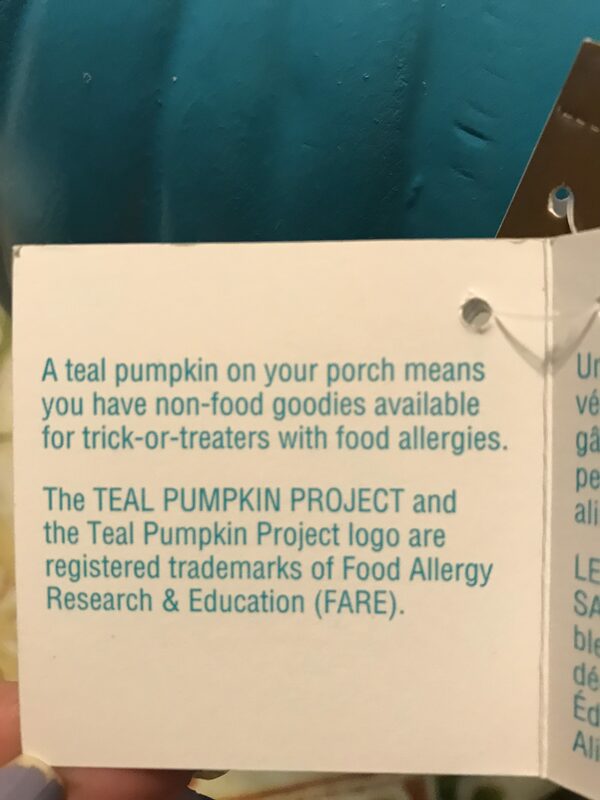 I love the idea of having teal pumpkin that indicates to trick or treaters that you have allergen free treats. Really cool. We don’t celebrate Halloween here but i have friends in the States who do. I totally love your page. I will definitely share this post with my friends. Thank you, Sue! I really appreciate that! I really love the idea of the teal pumpkin too & hope others realize it’s significance to help all kids enjoy trick-or-treating. I never really thought of anything but peanut allergies, since my cousin’s son has one & we used to take him trick-or-treating in my neighborhood. Most people aren’t aware and awareness is key. Even if someone is able to stash treats to the side or have non-food treats like Halloween pencils or necklaces or something, that’s always helpful & everyone can be included. I saw Gluten Free and all I could think about is Kourtney Kardashian, lol. I don’t know how gluten free stuff taste, and I sincerely wouldn’t love to know because I love my milk too much, lol! I wish I could try out Halloween though! 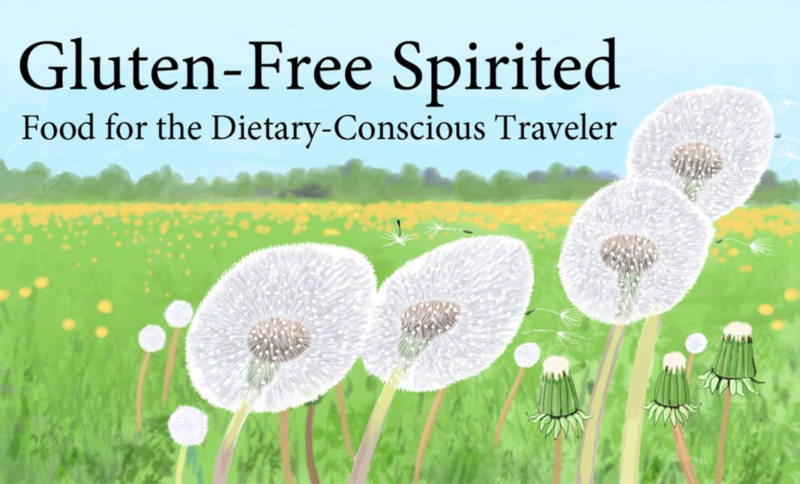 LOL I didn’t realize she was gluten- and dairy-free. I had to Google it after I saw your comment. 😀 I love dairy too and I would hate not eating it. Luckily for my sister, she’s never been a big fan of chocolate like me, so it isn’t too bad for her! Halloween is fun! I wish you could experience it too. So important, and thank you for reminding me to put a teal pumpkin out this year!!!! You’re welcome, Thena! I just got mine about a month ago. That is a really thoughtful idea. I don’t think I’ve ever considered that before thinking kids just want to candy. But, I like this. Some people just think of peanut allergies (which is obviously a big deal), but I think this is a good way to let parents & kids know whose homes have stuff that they can safely have. Im not going to lie I couldnt stand those halloween pumkin candy. But this post isnt for me its for people with restrictions I didnt know they were gluten and soy free. Wait a minute, I did a double take when I saw the teal pumpkin! Is that real? Or is it a container full of candies? But I thought it’s great to have this initiative for people to have the choice to come for non-food trick or treats! 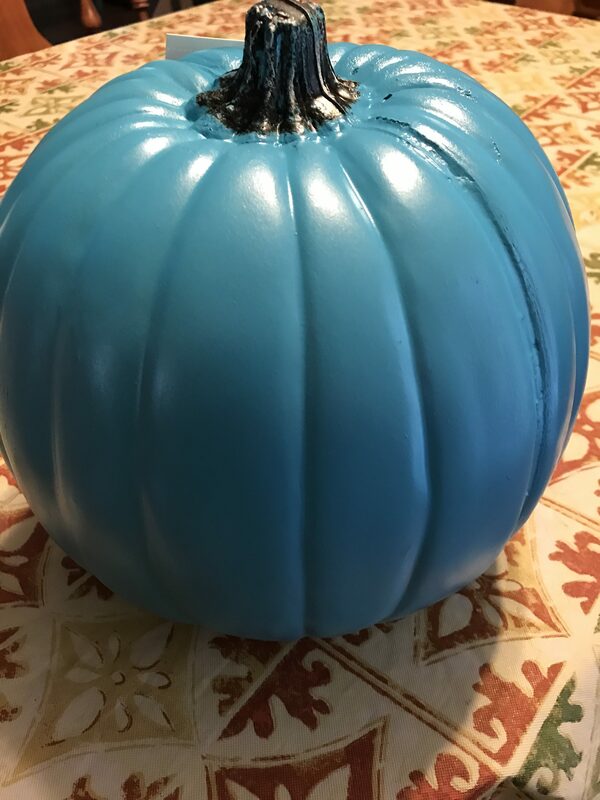 It’s a plastic pumpkin that is painted teal. I bought it at a craft store that way. Some people will buy real pumpkins and paint them teal. I figured this was more practical since I can use it every year. Hey, I never knew that about teal pumpkins!!! I can say it is a very pretty pumpkin and plan on doing the same! The organization behind it (FARE) started in 2012. I didn’t find out about it until a couple of years ago. I bought my pumpkin at Michaels about a month or so ago. This is so great and very helpful! I’m gluten free, dairy free now and this helps a lot! I’m glad that you find this helpful, Nicole! It is a great idea to put a blue pumpkin outside your door to let children know that they can get candies suitable for their intolerance. I can’t imagine something worse than a child who is unable to eat Halloween sweets. I think its a great idea too! It’s not something most of us even think of, so it’s a great way to promote awareness.